Last word on this post. Tomorrow is a very long hard day and I may not have energy to post for a day or two but will get any new photos out to you as soon as internet and my exhaustion let me. 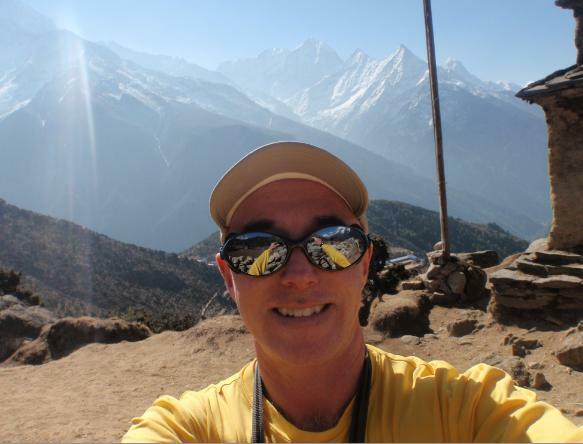 Let me tell you how much you have to want this to be able to handle the physical demands of this trek....even with sherpa help! Namaste! Namche from above just before we climbed down the trail back into town. the blue are the roofs of the buildings. 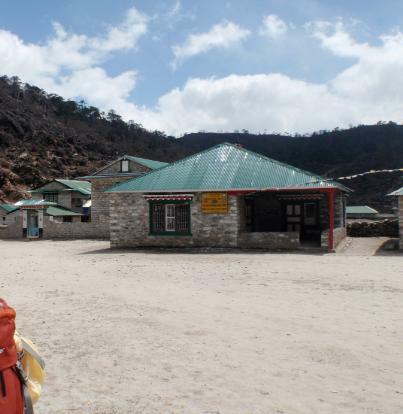 Sir Edmund Hillary School where kids from grades 1-9 all get schooled within the valley. Familes send their kids to other families sunday PM to friday PM to get an education. 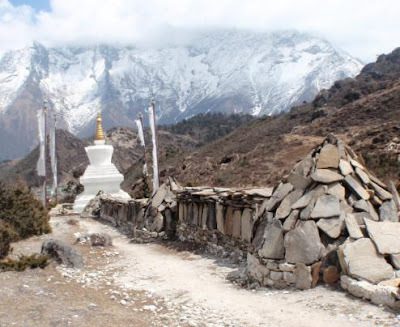 A gumpa (religious reference point) along with the stones here that actually have carved nepalese prayers on them. In buddist tradition, gumpas and other religious monuments are passed on the left. 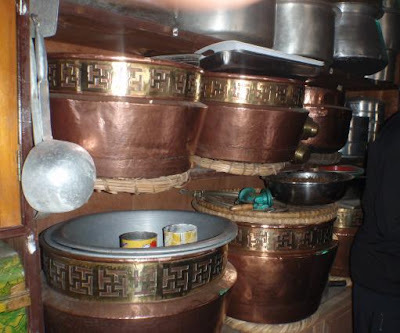 Large traditional Tibetian bowls used for cooking or storage. 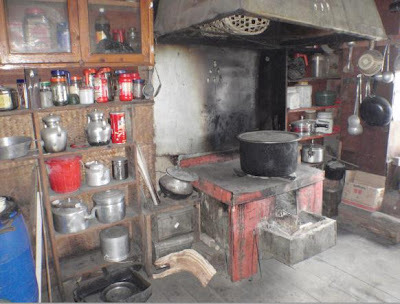 Most sherpas use single bowl cooking so as not to require much cleanup and not to waste anything. 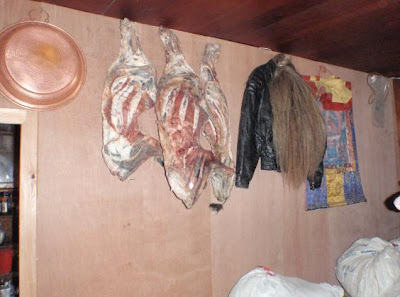 And of course every sherpa home would not be complete without dried sheep meat in reserve for special occasions or a yak tail for ceremonial purposes. Here is their traditional kitchen where meals for the entire family are made. Sherpas do not use traditional beds, but bed rolls, rolled up each night and the entire family sleeps in the great room in the house all together. If they have teen age children the parents may guide the children to sleep in a different spot each night. Here we each receive a ceremonial lanyard blessed by the lama for good spirits and wishes to each of us for our travels. For lunch we were invited into the family home of Ang Lima Sherpa, one of the lead Sherpas on the expedition. This is his backyard view. Sitting out back and enjoying the view is not something that he ever probably considers just sitting out one day and watching (the sherpa work ethic is incredible...they work ALL the time!) but it is EPIC. 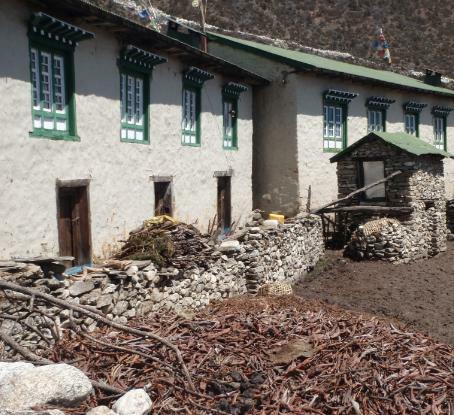 Here is a modern day sherpa house. The lower floor is for storage of potatoes and other food stuffs and for storage of the dried yak dung that is used like firewood for heat over the brutally cold winters. The families live on the second floors. 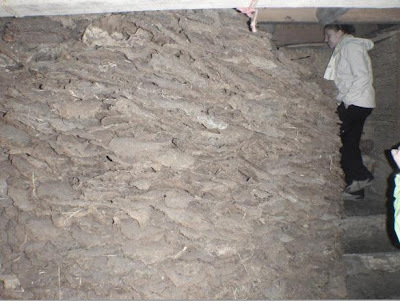 The yaks also live indoorson the lower floor all winter...so their warmth will radiate up from the lower floor into the living spaces helping to heat the house. Absolutely nothing goes to waste in the sherpa culture. The tend the land with respect and precision and are working hard to keep the region pristine. Some of the other peaks and glaciers. This is peak 32. 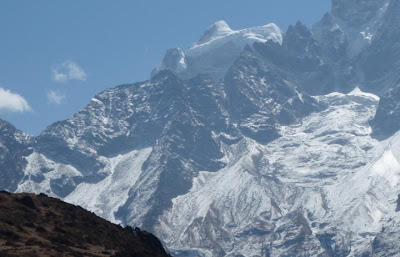 See the massive icefall facing us..the only safe ascent is right up the icefall face...which has periodically broken, killing climbers regularly. Everest in background...still poking into the jetstream, causing the vapor trail you see coming off of the center peak...that is how tall it is! 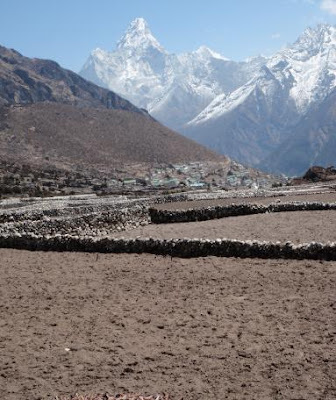 A football field sized runway for delivering supplies to the high communities above the valey. See the plane about to land? 5 sherpas emptied the cargo and he was back on his way in 5 mins. How can you not have a great time, when this is the background of your day? Tim, giving us instructions on the days events, the path we'll take and how to do the trekking walk. Turns out their is a special pause the sherpas do that gives them a momentary rest while walking and helps to explain how they can walk 6+ hours with packs and not take a break. Before the rest of the post, gotta say these yaks are not nearly so docile as people lead you to believe. They wander the street, have free reign and keep me on my toes! See above photo snapped the moment before I got the hell out of dodge...he saw me and wanted to play mattidor. 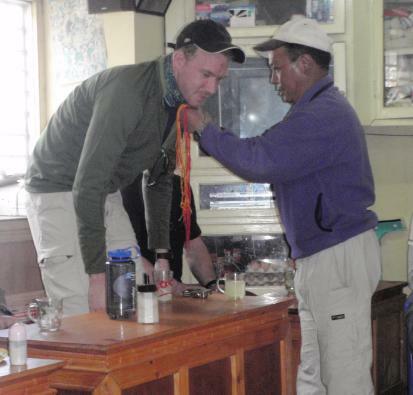 On the first full day of treking, I had the lucky/unlucky award for the first to get attacked by a yak. Walking up the trail the yak train was heading down the trail and I was lucky enough to be by a stone fence a couple of feet high and walked to the break in the fence and up about 4 feet onto the hill. All yaks passed by without incident till the last one....which passed me, turned around and ran full bore thru the break in the fence and into this persons back yard. Me? I hoped the fence back onto the trail to the laughter of all who saw it. The sherpa said he could not imagine what could have made the yak do that. Yup, me and animals...the irony is just amazing. 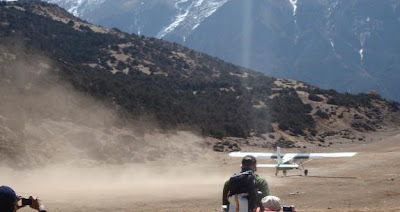 I have caught several yaks attensions unintentionally since then and watched a sherpa woman slap a yak to get him to move and he came right at me. I jumped to the side and she slapped the yak back in line and laughed as he went on his way...now the other trekkers see a yak and immediatley surround me so as not to let the yak see me. Hysterical. 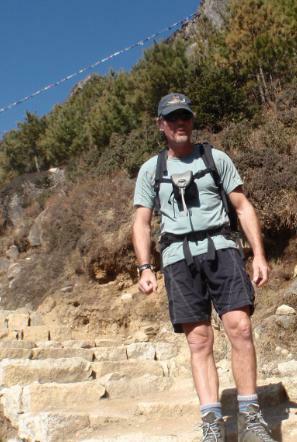 Now back to the trek!